Racing Pinewood Derby cars has been a Boy Scout tradition since the 1950s, and now many other clubs and organizations are getting in on the action. The premise is simple: build a car out of a piece of wood, four nails and four wheels, and get it to the end of a sloping track as fast as possible. Since these cars rely solely on gravity and momentum to win, reducing friction is the name of the game. Here are 30 tips to get your car looking and racing its best on race day! Inspect Your Block - Make sure your block isn’t warped. Check by placing it on a flat surface and pushing down on each corner with your finger — the block should not rock. If it does, get a new kit. Make It Aerodynamic - To reduce air drag, cut your block so it’s wedge-shaped rather than square. Taper the Bottom of Your Car at the Front - This will keep it from rubbing against the track at the bottom of the slope as the track becomes flat. Lift One of the Front Wheels, so it Doesn’t Touch the Track - If your competition allows it, raising one wheel is an easy way to reduce friction. Decide which wheel to lift by sending your car down a straight line and seeing which side of the line it drifts toward. If it drifts left, raise the left front wheel. If it drifts right, raise the right front wheel. Check Out Your Track Beforehand - Is it steep with a very little flat area at the end, or does it slope more gently? You may want to change your car based on the track slightly. Max Out Your Weight - Most competitions allow a maximum weight of five ounces, and you’ll want to meet that max weight to increase your car’s momentum. One easy way to add weight is to attach tiny metal weights to the car’s body. Make Space for Weights - Make sure to leave at least 3/8 of an inch clearance between the bottom of the weight and the track. Polish Your Nails and Axles to Reduce Friction - Polish the axles with sandpaper dipped in water. Just put the nail in a drill and hold (or even tape) the trigger so the drill constantly spins while you hold the sandpaper against the nail. Pick the Straightest Axles Possible - Find which nails are straightest by having a parent put them at the end of a drill and turn the drill on. Whichever nails “wobble” the least are the straightest and best choices for your car’s axles. Align Axles - If your car’s wheels and axles are out of alignment, it can drift against the side of the track, causing friction that will slow it down. Test the alignment by drawing a straight line and pushing your car down it, then seeing which way it veers. Then, starting with the front axle on the side your car is veering toward, turn each axle about a quarter turn and repeat the straight-line test until your car is running as straight as possible. Repeat the process with the rear axles. Bend Axles to Reduce Friction and Help Alignment - If your car still isn’t going straight after turning each of the axles, you may need to slightly bend one or more of the offending axles by putting it in a vice and lightly tapping it with a hammer. Polish Wheels - You can use toothpaste in a pinch, or purchase a plastic polish made specifically for Pinewood Derby cars. Lubricate Wheels and Axles - Do this before attaching the wheels and axles to the car. Experts recommend spending five minutes per wheel adding graphite powder (or your chosen lubricant) and spinning the wheel on the axle to make sure it’s moving smoothly. Don’t Re-lubricate Between Races - Or if you can, make sure to do a test run before the next heat. Graphite powder works best after it’s been broken in slightly. Use Lighter Weight Wheels - Some competitions don’t allow it, but if yours does, it’s worth the upgrade to purchase lighter weight wheels. Try Rail-riding - In this technique, you’ll actually modify your car so that it will contact the guide rail with a wheel — typically the front wheel that touches the ground in a three-wheel model, or the dominant wheel in a four-wheel model. Rail-riding cuts down on oscillation or the back-and-forth bouncing off a car between guide rails. Slightly bend your axles with a goal of having your car drift two inches toward the non-dominant or raised wheel over a four-foot test roll. Narrow the Body on Your Rail Rider - Some experts recommend narrowing the front “dominant” side of the car about 1/16th of an inch in relation to the same side rear wheel, which will keep the rear wheel from touching the guide rail and cut down on friction. Pick Your Shape - Trace the side of your block onto a piece of paper several times and figure out what kind of cuts you’ll need to make to achieve your desired shape. Prevent Cracking - Whatever shape you decide to use for your car, leave at least a quarter inch of wood on both sides of the axle slots. This will prevent cracking when you insert the axles. Sand It Down - Use sandpaper to smooth your block of wood, turning it into a sleek surface. Choose coarse sandpaper to round corners and medium or fine-grit paper for the car’s body. Hide Wood Grain with Liquid Sanding Sealer - It may take multiple coats, but the finished product will be worth it. Make sure to let it dry thoroughly between coats. Add Numbers or Decals - You can buy numbers or decals from hobby stores or paint your own. Make sure the edges don’t curl when you seal it with your clear gloss. Seal with Clear Gloss Paint - Once you’re satisfied with your design, seal it. Some people prefer sealant from a spray can and others like the type you brush on. Get a High Shine - Cover the car with floor wax paste. You’ll need to make sure the paint has dried for several days first. Wheels and Axles - Don’t add wheels and axles until you’re done painting the body of your car. This will ensure the wheels and axles don’t get covered in sealant and paint. NASCAR, IndyCar or Formula 1 - Since you’re creating a mini-racecar, take your cues from the life-sized versions. Pick your favorite driver and model your car to look like his or hers. Superhero-inspired - Comic book heroes are all the rage at the box office these days. Tap into their super spirit with a car based on your favorite hero (or even group of heroes, like the Justice League or The Avengers). Sports Team - Splash your team’s colors all over your car to bring some spirit to the race. Video Game - Pick your favorite game, such as Minecraft or something retro like Super Mario Brothers, and decorate your car to match. Using these tips, you’re sure to wow the crowd on race day. But remember, you’ll need to check your competition’s rules to determine which modifications are allowed. Happy racing! 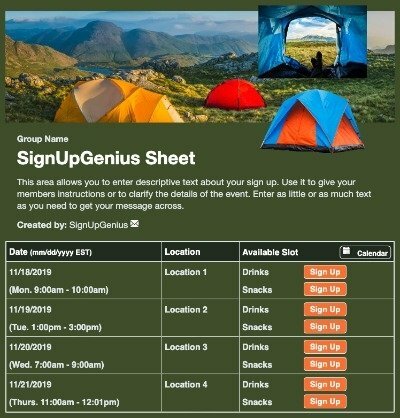 Organize camping trip food and supplies with a sign up. 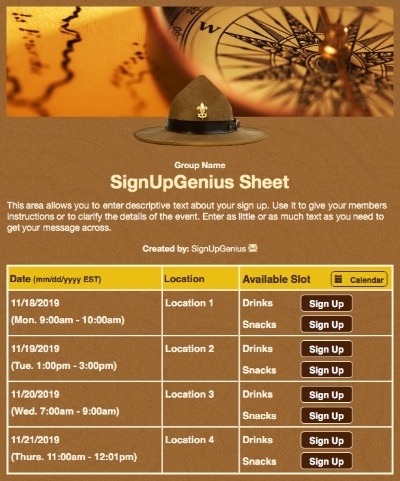 I love SignUpGenius' ease of use and functionality. 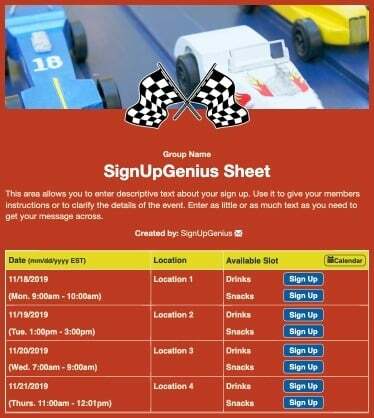 In just the last few weeks I have used SignUpGenius to help manage Girl Scout outings, Secret Santa Sign-up, a potluck, and volunteer opportunity at our preschool. The possibilities are endless.... I've tried other sign-up websites and find yours by far the best fit for my purpose.